Are Clams Safe to Eat? Clams harvested from approved waters, handled and processed in sanitary conditions, and properly refrigerated are safe for raw consumption by healthy individuals. Harvesting waters are monitored by states and local jurisdictions. If excessive levels of contaminants are found, commercial harvesting of clams and other shellfish is prohibited. Recreational fishermen should harvest clams only from waters that are safe and approved for harvesting. State or local health authorities often issue warnings and closures to advise recreational harvesters. Federal, state, and local officials use the guidelines of the National Shellfish Sanitation Program in regulating the growing, handling, processing and distribution of clams. These guidelines require product labels and tags to include a certified dealer number. This number indicates the dealer’s firm operates in accordance with the National Shellfish Sanitation Program. What Are the Visible Characteristics of Quality Clams? Clams are molluscs with two hinged shells (bivalves) which filter their food from the surrounding water and are buried in mud or sand in shallows of both fresh and salt waters. Several species of clams are commercially and recreationally harvested on the east, west and Gulf coasts. The shape of the clam shells vary with species and may be elongated, oval, round or rectangular. Clam shells should not gape and should close readily when tapped. However, soft-shell clams do not close completely because the neck or "siphon" often protrudes from the shell. Movement of the neck when touched should indicate the clam is alive. The clam should be discarded if the meat is dry when the clam is opened. Avoid eating clams with broken or damaged shells. Clam meat is usually a creamy tan color with firm texture and should smell fresh and mild. Hard clams, also called hard-shell clams and quahogs, are sold in various sizes as chowders (used in chowders, fritters and stuffing), cherrystone (used raw and steamed on half shell), and little necks and top necks (used raw and steamed on half shell) along the east and Gulf coasts. Manila and littlenecks are found on the West Coast. The soft-shelled clam has an elongated shell, which is thin and brittle and has a large hanging neck. The soft-shell clam is found from Maine to northern Virginia and on the West Coast. The soft-shell clam is known by such names as the Ipswich, belly, longneck, manninose, steamer, and other local names. 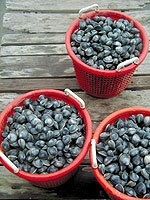 The surf clam, also know as the skimmer, beach, giant, or bar clam can be found from Maine to South Carolina. The surf clam is smooth, tan colored and oval and is the most abundant and largest of clam species. Surf clams are used primarily as a canned product in chowders and breaded strips. How Should Clams Be Handled, Cooked and Stored? Wash clams and remove debris before storing clams in the refrigerator. Cover with a clean wet towel to prevent drying and store in a cool, dark area at 32 o to 45o . Clams should be consumed as soon after harvest as possible. Handle and store raw and cooked clams separately to avoid cross contamination. Work area and utensils should be thoroughly cleaned. Follow a "use by" date if provided. Clams are often cooked prior to consumption. When boiling or steaming clams, use small pots to ensure even cooking. After shells open, boiling should continue for 3 to 5 minutes. Steam 4 to 9 minutes. Clams in the shell and shucked clams may be frozen. To prepare clams in the shell for freezing, scrub clams under cool water to remove mud and grit. The shells of frozen clams open easily when held under warm water. Clam meats can be frozen also, but when thawed, the texture of the meat is softer and is more often prepared cooked. Clams should be frozen quickly and kept at a temperature of 0 o F or lower. Rapid freezing results in less tissue damage. Freezer bags and plastic containers with lids are preferred for freezing. Clams should be frozen in their own liquor or water, and excess air should be removed from the containers to prevent freezer burn. Frozen clam meats should always be thawed in the refrigerator for 24 hours and not be refrozen. What Is the Nutritional Value of Clams? Clams like other bivalves are low in fat, high in protein and omega-3 fatty acids. Clams are also a rich source of potassium and are relatively low in calories. Drain clams of their liquor and set both aside. Cook the salt pork or bacon in a skillet over medium heat until crisp. Transfer to absorbent paper. Add the onion to the fat in the skillet and brown lightly. Cook the potatoes in the boiling salted water until just tender, then add the bacon, onion, salt and pepper to taste, and clam juice, and simmer 5 minutes. Add the cream, and bring to a boil. Correct the seasoning; add the clams, and just heat through. Serve with a dollop of butter, the merest pinch of thyme, and a bit of chopped parsley.